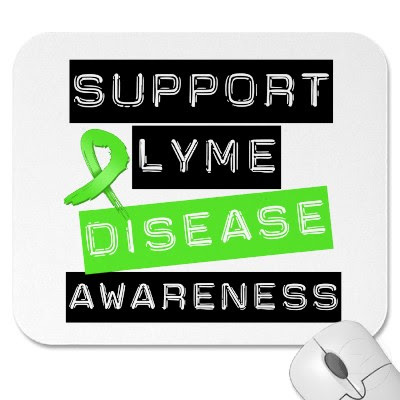 May is Lyme Disease Awareness month and those of us who have Lyme Disease will be continuing to help bring greater awareness to this serious, debilitating illness during this time. Hopefully, Dr. Phil's show on Chronic Lyme, which aired last month, helped open the door to start dialoging about this more openly and began the much needed process of better education and awareness; even in the medical community. Chronic Lyme Disease not only affects the person who has it, but their entire family as well. It takes a toil physically, emotionally, mentally, spiritually, relationally and financially. Lyme Disease knows no boundary. Many people are suffering from it's effects, including children. If you don't have Lyme, perhaps you know or love somebody who does. I encourage you to acknowledge or support them in some way this month. Please share this link. Or you might consider right clicking on the photo above and saving it to post on your own blog, Facebook timeline or Twitter page. You can let others know who you are posting it for and/or that you want to help make people better aware of this disease. I so appreciate those in my life who support and encourage me; it means a great deal. Ticks are everywhere and many entomologists are saying Lyme Disease cases may be much more prevalent this summer because of the unusually widespread warm winter we've had, which is the weather ticks are most active in. So it would benefit everyone to take the time to better inform themselves about the prevention of Lyme and other tick-borne diseases as well as the proper method of tick removal. I've listed some resource links below. I invite you to go Lyme green in honor of Lyme Disease Awareness this month. Any support is greatly appreciated. It all makes a difference. Thanks for reading. I'll be posting more on both my blogs throughout this month.